You love watching movies, don’t you? ...or a big Soundbar that sits just under you TV producing movie sound in all it’s glory. Since TV speakers are dysfunctional in creating any good quality audio experience, we upgrade to bigger and better sound system, don’t we? Then why the hell are you searching for best headphones for watching movies? ...or you just want to indulge in an immersive listening experience for your favorite movies. If you know something about Pro-Audio and Cars Music System; there are chances you might have heard about this brand called Pioneer. For many years; the brand has excellent reputation in producing innumerable pro-audio products that have been dazzling musicians, as well as average consumers like us. Pioneer SE-M521 is one those products targeted directly at Average consumers with hell-break-loose price and Pro-DJ like design. These are closed back headphones enclosing 40mm diameter drivers. If you don’t know what closed back headphones are… refer this guide. The design of these headphones is like the one seen on DJ headphones; however the earcups don’t fold. Featuring a twin-headband design; gives it a look of very premium headphones range. With a frequency range of 7Hz-40kHz; these definitely are best surround sound headphones for movies. These are an over-the-ear type headphones; which are comfortable for long hours of movies watching as the earcup covers the entire ear rather than sitting on it. The cord length is 3.5 meters which is an added advantage and gives ample of distance between you and your TV to keep. "For the current price; the entire built is plastic and back of earcups have glossy finish. 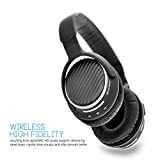 However with a rating of (4.4|5) stars on Amazon; these are definitely worth giving a try if you need a headphone specifically for watching movies at cheap price." Ok! This is the second time I’m featuring the Panasonic RP-HTF600S; earlier I had featured it in our list of 20 Best Headphones for Rock Music. The headphones are very comfortable to wear and fit snugginly around the ears. Build quality is something Panasonic can boast about for such a cheap price. Going by the look; it feels like a closed back headphones; however it has a semi-open kind of design allowing free movement of air. It can produce a large spectrum of sound emphasizing even the minute of details due to its 50mm drivers. The earpads are big and cover the entire ear… however the material used for the earcups is faux leather; your ears have chances to become sweaty and heated after an hour. …that offers great comfort for listening your movie for the entire course. 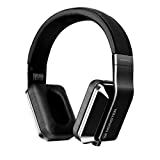 With a rating of (4|5 stars) on Amazon; Photive BTH3 is one of the best Wireless Bluetooth Headphones in our list. 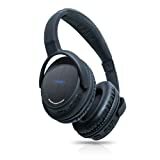 Now coming to Photive BTH3 (check full review); these are Bluetooth 4.0 enabled Wireless Headphones; that charges quickly and even with a small battery gives BTH3 battery life of 12 hours… enabling you to watch 3-4 movies in a go without charging them. Photive BTH3 Over-The-Ear Wireless Bluetooth Headphones with Built-in Mic and 12 Hour Battery. Includes Hard Travel Case. Bluetooth 4.0 Stereo Headphones- Advanced Bluetooth CSR version 4.0 Latest technology. Wireless Freedom- Stream music directly from your smartphone or tablet, and be free of annoying, tangled cords. Charges quickly and lasts hours- The PH-BT3 headphones feature a lithium-ion battery that not only charges quickly, but gives you up to 12 hours of battery life. Compact form factor and stylish design- These headphones were designed to be small enough for you to comfortably tote around. Soft-touch rubberized exterior, for a wonderfully smooth, tactile experience. For the price; the entire headphone is built out of plastic… however the built quality is totally excellent. The design looks generic and is a pretty common thing from such newer brands. A hard carry case has also been provided by the company; allowing these to be carried with you in your travel plans. The best part is… Photive BTH3 also features an inbuilt mic and hence this best wireless headphones for TV will also find great application for your smartphone, tablet or laptop. One for connecting a stereo cable; so as to use these like a normal wired headset incase of dead batteries and another is for USB Power charging. Let us know if you do or do not think the Photive BTH3 deserves to be in our list of best headphones for watching movies. "All in all if you want a best wireless headphone for watching TV and using it with other devices without breaking a bank; Photive BTH3 it is." I'm a fan of MEE Audio products; as they tend to offer great sound experience for just a throwaway price. The company doesn’t have many products under its name like other popular headphones brands… but the ones they do have giveaway excellent audio performance. MEE Audio AirFi Matrix 2 is no exception to this statement and hence got featured in our list of best wireless headphones for TV. Just like the previously mentioned Photive BTH3; the AirFi Matrix 2 offers Bluetooth 4.0 connectivity which gives it a whooping 22 hours of battery life. Additionally it offers features like aptX and AAC audio support which makes the music experience a lot better when listening to audio from Blu-ray movie discs. For a price under $100 the company also throws in NFC support. Design wise and look wise; the Meelectronics AirFi Matrix 2 is very similar to Photive BTH3 except some aesthetic changes. "The Meelectronics AirFi Matrix 2 costs double the price of Photive BTH3. However with features like aptX, fast charging, 22 hours support, established brand makes the Matrix 2 a better choice." The reason why I chose Sennheiser HD419 over the Sennheiser HD429 is that the former has better ear pads compared to latter and both of them have similar sound signature. The single-button remote and microphone on the cable make it easy to take calls with your smartphone. 32mm, 18-ohm proprietary Sennheiser transducer is ideal for use with portable audio devices, tablets and mobile phones. Folding headband allows the headphone to be collapsed for storage when not being used. 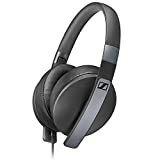 2 year warranty when purchased from an authorized Sennheiser dealer. Considering the price; these headphones comes in a blistering packaging which I am really not fond of. Talking about the design; it all blacked out with matte finish and engraved Sennheiser branding. The back of ear cups features an engraved Sennheiser logo and similarly on top of headband. HD419 features the most comfortable ear pads of the lot and you can go upto continuous 4 hours with them without breaking a sweat or your ears feeling warm. The entire build quality is excellent and the Sennheiser HD419 is manufactured like a rock. For any average person who looks up these headphones won’t believe that they cost so cheap. These are single monitoring headphones; which means only left side of headphones has wires attached to it… which reduces wire tangling. One concern that I do have about them is the small diameter of wire used which feels likes it will snap anytime with a jerky reaction. "With an all matte black design and fabric foam padding on the ear cups and under the headband… these are definitely one of the best wired headphones for tv in our list to vouch for." Monster Inspiration are one of the best looking wired headphones in the market for a very long time. At least I like them a lot. If you look up its images on Amazon.com; you won’t see any wires… however these are wired headphones and does not support Bluetooth. …they are active noise cancelling headphones; allowing you to enjoy your movies with outmost silence even when there’s a loud party in next room. To take advantage of the active noise cancelling feature; you need to insert two batteries inside them; however they can be used without inserting the batteries but it will be void off the active noise cancelling features. Inside the box; the company provides a D-shaped leather carrying case which makes these easy to store anywhere. Also included in the box are three cables; two of them have mic with one for Apple and another for Android users; the third cable comes without any mic. Padding on the earcups and headband is pretty cool and it’s impossible to not fall in love with it’s simple yet elegant design. "If you’re looking for headphones that provides great quality music and also brings in class; Monster Inspiration are the way to go." Golzer BANC-50 is a great set of wireless headphones that have features like Bluetooth 4.1, Active Noise Cancelling and aptX support. Active Noise-Cancellation rate: 85%, Perfect for Air Travel. Also features Built-in Mic and wired mode. Includes Hard Travel Case. 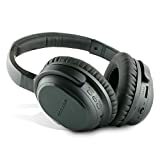 Golzer BANC-50 has a similar design just like the previously mentioned Photive BTH3 and Meelectronics AirFi Matrix 2, it also features button on both the earcups. The package also includes a soft carrying pouch to store the headphones and all it’s accessories. As per the reviews; the Noise Cancelling feature works as advertised and reduces upto 85% of ambient noise. However the technology isn’t as advanced as the one used in Bose Headphones; however it does gets the job done. Earcups have a oval design with big size and good amount of padding which blocks noise even when Noise Cancelling feature is turned off. "All in all; the Golzer BANC-50 is a feature packed but generic looking wireless headphones for watch TV." Avantree is a brand that’s very new and just arrived to the scene, however it has bunch of excellent audio products under its name. 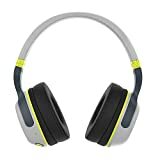 NO AUDIO DELAY WHILE WATCHING TV or PC: These top-rated wireless Bluetooth headphones work with any aptX low-latency supported Bluetooth transmitter (Avantree Oasis or Priva III recommended) for minimal audio delay of 32-40ms (non-detectable by human ear) for a lag-free audio experience. (If your TV is not Bluetooth-equipped you will need a SEPARATE transmitter to connect to it. Avantree Transmitters are Recommended). SUPERIOR Hi-Fi SOUND: Experience superb music and voice clarity. Built-in bass boost feature lets you tailor your audio experience for TV, music on your Playstation, xbox or PC, with rich lows and clear treble. The perfect headphone for audio lovers. COMFORTABLE & SUPER LIGHT: These over-the-ear wireless headphones come with super soft earpads and an easily adjustable headband providing a comfortable, customized fit. An ideal choice for long periods of watching TV. MULTIPOINT and EASY TO USE: Connect to two phones simultaneously and never miss a call. Use the NFC feature for easy one tap connection. Intelligent voice prompts clearly identify the status of the headphones. After initial pairing headphones auto-reconnect to any device, easily and instantly. Buy one for yourself and an extra set for an audio lover you know today! It’s a successor to Avantree Audition which we’ve mentioned here happens to be a good choice when it comes to best Bluetooth headsets under $50. Coming to Audition Pro, the design hasn’t changed much, however should I say it looks more premium compared to its predecessor. Building on the excellent wireless capabilities of the original Audition, the Pro version has dug deeper and now comes with Bluetooth 4.1 technology along with low latency aptX high resolution audio. In layman terms it means that there won’t be any noticeable delay between audio and video. Basically a Low Latency AptX support headphones have latency of 40ms and goes unnoticed to the human ears. Hence you won’t notice any delay between audio and video sync. It has a 40mm driver inside and impedance of 32 Ohms. It also offers a battery life of 40 hours on full charge making it not to run for the charge to power it every now and then. The design is foldable which means you can collapse these headphones and store them safely. Inside the box you get the headphones along with a micro-USB cable, 3.5mm AUX cable, and a nice D-shaped carrying pouch for easy handling. Being a Bluetooth headset (yes it comes with an inbuilt mic), you really wouldn’t be able to tell the difference in sound quality compared to wired headphones. If you ever feel the urge to connect this one to an amp or DAC, then you also have aux cable to use it for. Ok! Let me first clear out… I’m not a fan of the Skullcandy series of headphones; as they don’t sound anywhere close to what you pay for. Long lasting battery life lasting 12 hours after a full charge. Backup Cable w/ Mic + remote functionality, just in case. Powerful 50mm drivers for refreshingly loud and clear playback. Noise isolating fit through soft touch leather seal around the ear. On-Board Mic pulse remote for taking calls and switching up playlists. However after listening to Hesh 2; it’s been in my high regard ever since. Relatively Skullcandy Hesh 2 comes in two models; the one is wired whereas the one I’ve mentioned here is the wireless version (costs twice the wired version). Third one is kind of funky looking having grey as dominant color with florescent assents. This is the first ever Wireless Bluetooth Model from Skullcandy and got featured in our list of best wireless headphones for TV. Even for the first time it features a large 50mm drivers which is a prime reason that these headphones to sound so good. "Earcups have a round design rather than a natural oval design which does make it uncomfortable to wear for long hours like 4 hours or so… however the padding is excellent on these making them the best headphones for watching movies." I am an ardent fan of Audio-Technica’s X line of headphones. Costing just under $100; the Audio Technica ATH-M40x (check full review here) features a unique design compared to other brands of headphones with a brilliant sound signature. The ATH-M40x is cheaper sibling of the bigger M50x and have almost similar set of features for a cheaper price. If you look at its box; it’s huge… very huge to say the least. Inside the box you’ll find a faux-leather carrying pouch along with a couple of wires. One wire is a long straight cable; whereas the other one is coiled cable. Major difference between the M50x and M40x is the driver size; as these comes with a 40mm drivers whereas the bigger brother stores a larger 45mm driver. Built quality is sturdy and these headphones are manufactured with long sessions in mind. Hence for a movie that is very long; you’d be very comfortable wearing these. Overall padding on entire headphone though minimal; still makes it feel very comfortable. Earcups aren’t heavily padded and that’s good because it increases the overall weight. Earcups swivel around and entire design is collapsible; making them easy to store and take anywhere around. "I usually suggest Audio-Technica ATH M40x to anyone who is looking for a decent pair of headphones under $100 and hence is also featured in our list of best wired headphones for TV." …it is my crush; that I can hear but can’t own. Bose SoundTrue… though carrying the brand’s legacy of excellent sound quality has now come down to an affordable price level. Weighing at just 4.9 ounces; these are the lightest of headphones in our list of best headphones for watching movies. Being lightweight; equals to less stress on your neck, and more hours of movie watching. Even for a price just over $100; the Bose SoundTrue packaging is very premium and the company also provides a padded hard shell case to store these. The entire headphone has a minimal design with lesser earcups padding and smaller headband which helps in reducing weight by quite an extent. Earcups swivel by 120 degree and lay flat on any surface; however they do not fold. The removable wire features an in-line microphone along with a control buttons for volume and call receive/end; also the length of wire is at 1.6 meters. 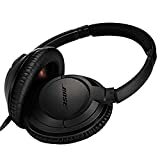 Out of all the wired and wireless headphones mentioned in our list; Bose SoundTrue is my favorite best headphones for watching movies. What’s yours? 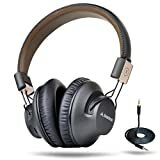 "Compared to all other brands of headphones; Bose headphones usually have quite a distance between the drivers and earpads so as to produce excellent sound visualization; which makes Bose Headphones very unique."